Advertising helps support diverse types of free content, fearless journalism and close-knit social connections that span across the world. But as the web has grown, the online ad experience has sometimes fallen short of consumers’ expectations, as indicated in part by the emergence of ad blocking. For example, ads that disrupt the browsing experience or delay access to content can frustrate consumers. In order to improve the consumer experience, leading international trade associations and companies in the online media ecosystem joined forces to create the Coalition for Better Ads. The Coalition conducts research in order to develop data-driven standards for online advertising. The goal is to measure consumers’ preferences about the types of ads they least prefer, in order to help the global marketplace take steps to deliver a better ad experience. In the first phase of the Coalition’s research, more than 25,000 Internet users in North America and Europe were surveyed about their preferences for different types of online ads. The research included desktop web (55 ad experiences) and mobile web (49 ad experiences). The results of the Coalition’s consumer-focused research define Better Ads Standards that identify the ad experiences that fall beneath a threshold of consumer acceptability. 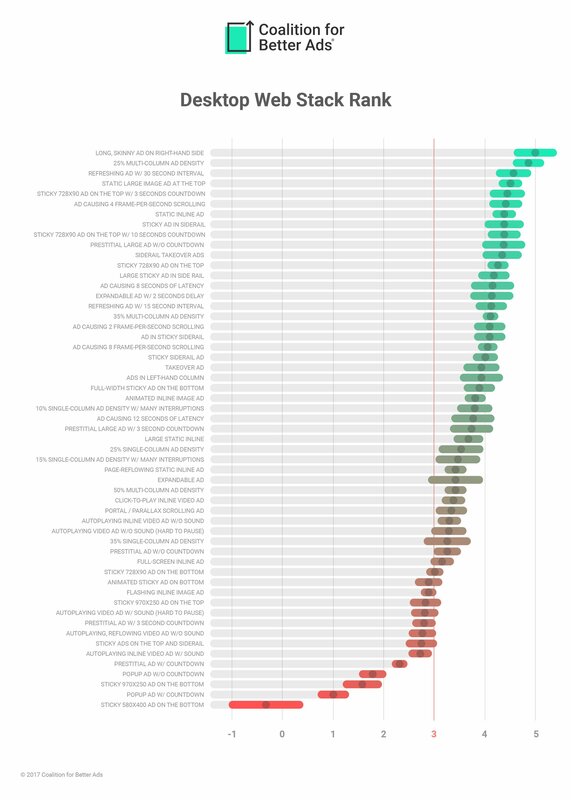 Better Ads Standards reveal the least preferred, most annoying ad experiences that are also most likely to cause consumers to adopt ad blockers. The research methodology was then used to measure consumers’ preferences in Asia, Latin America, and Africa. The research found strong alignment of consumer preferences across countries and regions for the most- and least-preferred online ad experiences, supporting the adoption of the same Better Ads Standards for desktop and mobile web globally. To date, more than 66,000 consumers in countries representing 70% of global online advertising spending have participated in the Coalition’s research. The Coalition plans to continue its research and test other digital advertising environments beyond desktop and mobile web. To determine which ad experiences most annoy and frustrate consumers, the Coalition for Better Ads uses a survey model that replicates the "real world" experiences of users, as they view ads while reading or consuming high-quality online content. The same model can be used in different digital ad environments, like desktop web and mobile web. Here’s how the research worked with the Coalition’s methodology. Paid participants across different demographics were selected in North America and Europe. The participants were each asked to read articles on four simulated content pages, three of which contained different ad experiences, and one of which had no ads. Participants were then asked to rate each ad experience on multiple factors, such as whether the ad was annoying or distracting. The survey participants also comparatively ranked the different ad experiences, based on personal preference. By merging these consumer preference ratings across thousands of survey participants, the Coalition’s methodology supports the creation of an overall “stack ranking” of dozens of different ad experiences, from better to worse. These consumer rankings are then combined with additional survey-based data designed to measure how increased consumer annoyance and distraction also correlates with a higher likelihood to use ad blockers. Based on this combined consumer preference data, the Coalition’s methodology makes it possible to identify the ad experiences that fall beneath a minimum threshold of acceptability for desktop web and mobile web — the Better Ads Standards for those particular digital environments. Testing of consumers for desktop web and mobile web reveals that consumers clearly differentiate between different types of ad experiences, producing overall rankings that identify the most and least preferred ad formats. Annoyance and distraction were among the most important factors in determining whether an ad experience would fall beneath the threshold defined by a Better Ads Standard. In addition, comparison of the consumer preferences from testing in North America and in Europe showed a statistical similarity in consumers’ ratings for the least preferred ad experiences in both web environments. 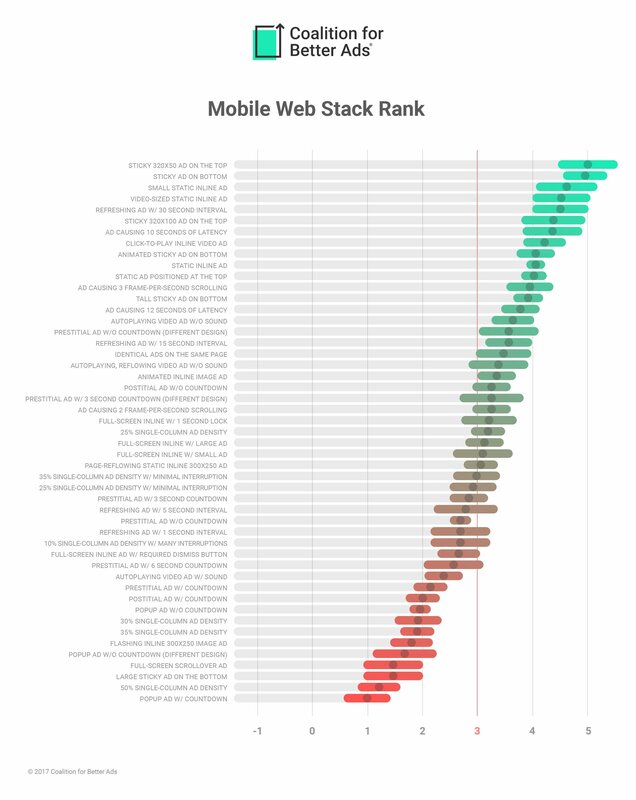 Because of this correlation, the Better Ads Standards for desktop web and mobile web are shared across both regions. Subsequent research conducted in Asia, Latin America, and Africa found strong alignment of consumer preferences across countries and regions for the most- and least-preferred online ad experiences, supporting the adoption of the same Better Ads Standards for desktop and mobile web. The Coalition plans to continue its research and test other digital advertising environments beyond desktop and mobile web. The Coalition encourages advertisers, publishers, and advertising technology providers to review its research and the Better Ads Standards, as part of their efforts in the marketplace to improve the online ad experience. The Coalition encourages advertisers, publishers, and advertising technology providers to review its research and the Better Ads Standards, as part of their efforts in the marketplace to improve the online ad experience.